It’s that time of the year again. Today is Tisha B’av. The day that we are all supposed to be sad. We all desperately try to feel the churban. We try to be sad despite the fact that Tisha B’av comes out in middle of the summer. In middle of camp and fun. There are speeches all around trying to get us to feel our loss. There are holocaust videos trying to get us to see what churban is. Hashem, I however, don’t need videos, I don’t need speeches and I don’t need to pretend to be sad. I don’t need to pretend to mourn our bitter galus. I don’t need outside resources to help me feel the pain of galus. I’m an abuse victim. Emotional and religious abuse of many many years, followed by sexual abuse for another five years. Although I’m many years past it all I still suffer the extreme consequences of it all. It doesn’t leave me alone. It wakes up together with me and goes to sleep with me, to be there in my nightmares. It follows me to work, to stores and to anywhere else that I go. Many of my life decisions are based in some way or another on all the damage that I have. I don’t need to try to mourn because I mourn every day. I don’t need to try to be sad because I’m sad everyday. I don’t need to try to cry because I cry many many days. I don’t need reminders to be sad because I have many many triggers every single day that remind me of my churban. The opening words of eicha which is the main focus of Tisha B’av is “eicha yashva b’dad. Why is it that we sit alone? Most people are not alone. Most people are in shul right now davening. Most people don’t hold the pain that I do all alone. Most people didn’t have to hide the secret that I held onto for many painful and lonely years. However, like I said, being an abuse victim is a lonely and painful life. I couldn’t go to shul because I get too triggered from it. I don’t have the strength for it. 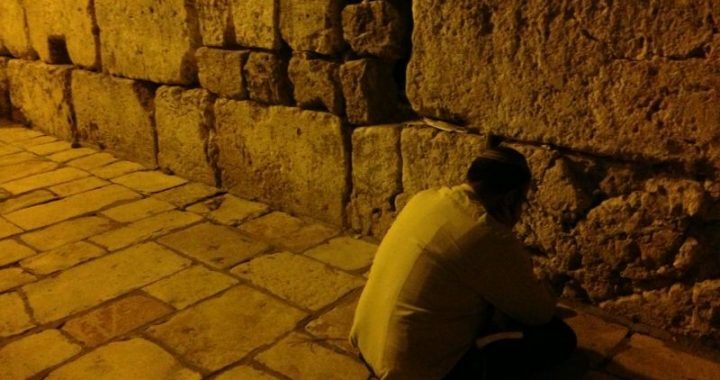 I just went through a Shabbos and for me shabbos is Tisha B’av. On Shabbos I have no distractions and am therefore forced to live with my pain. So here I am all alone. Alone at home. Alone in my pain. Alone trying to figure out how to live my life. Alone trying to figure out how to get through the day. Many people today are watching the clock to see when the day will be over. I already did that all yesterday on shabbos. I was counting down the hours and minutes. I needed a break from the noise in my head. It was so loud and so painful. So Hashem, do you see why I don’t need outside resources to make me feel sad? I don’t need to look at holocaust videos. I don’t need to look at cancer patients even though I have a cancer patient in my very own family whose very sick. Everyday is Tisha B’av for me. I’m sad every day. I dread every day. I feel alone every day. I usually try to push it away and get through the day but today we are allowed to feel sad and feel our loses. Yes, I lost my childhood. I lost my innocence and purity. I lost my sense of safety in the world. I lost my self esteem. I lost my rights to feel like I deserve anything. I lost my happiness. I lost my dignity. I lost my privacy. So i just wander around all day trying to get through the day. Trying to go to work despite all my inner turmoil. Trying to be a father and a husband despite all the noises in my head. I’m like a lone soldier who lost his whole battalion in an ambush, and is now just wandering around in enemy territory trying to find a way back to safety. Every step is measured. Every step is a potential underground mine which will rip him to shreds. And so he’s walking around with his senses on high, looking and seeing everything that he can possibly see, desperately trying to get back to safety while trying to stay hidden from the enemy. Additionally he’s wracked with guilt over how he allowed all his fellow comrades to be killed in the ambush. Why didn’t he see the ambush coming? Why didn’t he fight stronger and harder? The soldier is me. The loneliness is my life story. There’s still so much stigma and shame attached to abuse victims that everything is kept secret. I don’t have any fellow soldiers. I’m alone trying to find my way to safety. Yes, I’m also wracked with guilt. Why didn’t I stop my own ambush. Why did I allow my abuser to abuse me? Why didn’t I fight him harder? I lost all my friends as a result. I became a lonely boy in school. I was the outcast. I was the different one. I felt as though the whole world was on one side and I was on the other. Fast forward many years, I’m married now and have children. I have a job. But the damage was already done and although I’ve spent thousands upon thousands of dollars in therapy, I still feel it so strong. I know I’m healing and I know I’ll get there but I’m still that lonely soldier in the forest finding his way out. I’m running out of strength. I’m low on food and water. I’m low on energy. I’m losing my will to get home safely. It’s so much easier to just stop fighting and surrender to the enemy. I know however that I will never stop fighting because I have a wife and children that need me. But the going is tough. Really tough. Hashem, this is my life. This is my Tisha B’av. This is my mourning. I can’t mourn over 2000 year old churban when I have so much present day churban. Hashem, you are mourning and I am mourning. You are mourning the loss of your children and I’m mourning the loss of my childhood. Let’s mourn together. Let’s cry together. Let’s hold hands and cry. You’re all alone and I’m all alone. I’m in bed while everyone else is in shul. I’m eating today for my emotional and physical safety while everyone else is fasting. Hashem, my feelings and emotions are so heavy and loud. I simply don’t have room to mourn over the beis Hamikdash. But I do have room to mourn over the open love and connection that I’m not getting from you. I can’t mourn over the Bais hamikdash if I never saw it but I can mourn over the closeness that we don’t have because that I can see very clearly how I’m missing out on that. My seven year old daughter just came over to me and asked me for a hug. I stopped everything and gave her a huge hug and a kiss. I gave her the love that I’ve never gotten. I gave her the confidence that I never received. I gave her the belief that she’s the best person in my eyes no matter what and no matter when. Hashem, if I’m crying, I know you’re crying. Can’t we just end this long and bitter galus? Can’t we just be all together again? We need it so badly! You want it so badly as well. There is so much pain and illness in the world. There is so much abuse and trauma going on. Can’t we just end it all? Can’t we just be all together again? I so badly want that hug from you! I so badly want that love and support from You! I so badly need it, as well as well as all the other lonely sufferers out there. Hashem, I love you so much, I really do. I know that you love me as well. Why can’t we just hear that beautiful sound of the shofar? Why can’t we finally have that day of truth? The day when all the non Jews will see the truth. The day when all the Jews, the evil ones who hurt me and others so badly see the truth! The day when the community will see how much us victims suffer on a daily basis. The day when all abusers and abuse enablers will be forced to live up to their heinous actions. Dear Hashem, I’m yearning for that day! I promise I am, and I beg you please bring it soon. Maybe even today! All my love, your lonely and struggling son.